This week we are announcing Seven on Seven teams in advance of Saturday's event. Camille Utterback and Erica Sadun are game changers in art and technology. Camille Utterback's interactive installations have appeared in public spaces like San Jose's City Hall, and soon Sacramento airport. Erica Sadun's books on programming, digital video, and digital photography likely sit on the shelves of many emerging artists and technologists. 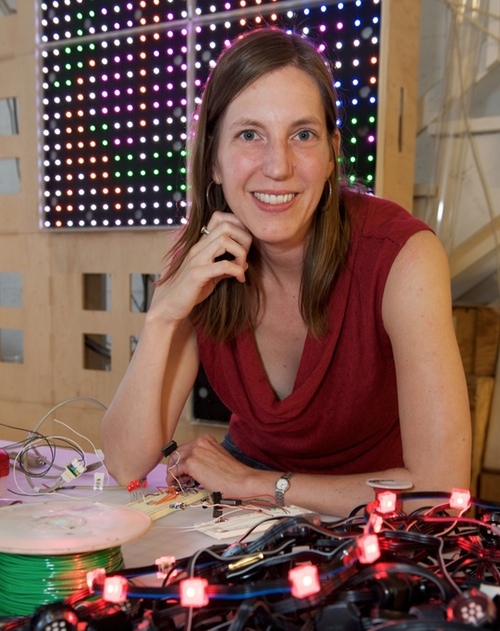 Camille Utterback is a pioneering artist whose interactive installations and reactive sculptures engage participants in a dynamic process of kinesthetic discovery and play. Utterback’s work explores the aesthetic and experiential possibilities of linking computational systems to human movement and gesture in playful, yet subtly layered ways. Her work focuses attention on the continued relevance and richness of the body in our increasingly mediated world. Utterback’s extensive exhibit history includes more than fifty shows on four continents. Awards include a MacArthur Foundation Fellowship (2009), a Transmediale International Media Art Festival Award (2005), a Rockefeller Foundation New Media Fellowship (2002), a Whitney Museum commission for their ArtPort website (2002), and a US Patent (2001). Her work is in the collections of The La Caixa Foundation (Spain), Itau Cultural (Brazil), 21C Museum (Louisvillle, KY), Hewlett Packard, The Pittsburgh Children’s Museum, and other private collectors. Recently completed public commissions include works for the City of St. Louis Park, Minnesota (2009), and the City of San Jose, California (2010). Utterback is currently working on commissions for the Sacramento and San Diego airports to be completed in 2011 and 2013. Utterback holds a BA in Art from Williams College, and a Masters degree from The Interactive Telecommunications Program at New York University’s Tisch School of the Arts. She lives and works in San Francisco. Erica Sadun holds a PhD in Computer Science from the Georgia Institute of Technology. She has written, co-written, and contributed to almost two dozen books about technology, particularly in the areas of programming, digital video, and digital photography. An unrepentant geek, Sadun has never met a gadget she didn't need. Her checkered past includes run-ins with NeXT, Newton, and a vast myriad of both successful and unsuccessful technologies.